Plexiglas is a material that is often used to replace glass. It is actually made of acrylic. It is categorized as a soft acrylic. That signifies that the Plexiglas has an extremely high sensitivity to heat that the other harder acrylic products. Plexiglas can even melt a little, they call it smearing. It can be chipped and other attributes. Learning to cut Plexiglas is not a difficult thing to learn to do. Read on for more information. 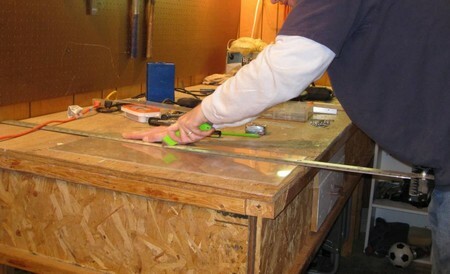 Utilize a measuring tape (or ruler) to decide how thick the Plexiglas you need to cut should be. The thinner the sheet is cut the higher the likelihood it will chip. You should use a saw blade to reduce the chances of the acrylic chipping. The more teeth in the saw the better the chances of keeping the sheet whole. Pick the saw blade you need to use by how thick and hard the Plexiglas is. You may have to use at least two (maybe more) different blades to alternate between uses. The harder acrylics actually chip a lot more than the softer acrylic. Soft acrylics like Plexiglas are prone to smear (melt) and will need saw blades with fewer teeth to cut out. Place the blade you are going to use on the end of your saw. A circular or table saw is the best option for cutting Plexiglas. Safety is always top priority. Wear safety goggles to protect your eyes from shards of acrylic that will be flying around when the Plexiglas is cut. Don them before you start to cut. Put the sheet of Plexiglas on the flat work surface and cut. If there is a substantial amount of chipping, switch to a blade that had more teeth. If the acrylic starts to smear, increase the teeth of the blade. It may take several minutes to gauge which saw if actually the most useful. Sand out any rough surfaces of the Plexiglas with some fine grit sandpaper. Paper attention to the edges. Keep you saws in good condition to make sure it gives you the best results when you have to use it. You don’t want the blades to get dull. Sharpen the on a regular basis. Clean the blades of the saw when they need to be. Plexiglas shards are dangerous. Clean the work area promptly; wear protective gear and sturdy work boots. Take every precaution necessary for you own health.